BEAUJOLAIS – FRANCE’S MOST UNDERRATED WINE REGION? Also aptly: the two toughest, most long-lived of them have more earth-bound names: Morgon and Moulin-à-Vent. Northern Beaujolais has an asset of incalculable value: a vast sea of very old vines growing on ideal terroir of decomposing granite. Such vines give naturally lower yields, with a commensurate increase in density and depth of flavour. Their juice can exhibit a very special complexity and mellowness. Another asset – specifically in this particular region – is the Gamay grape itself, a crossing of the noble Pinot Noir and an obscure white variety. Outside Beaujolais, it gives mostly simple wine, of uncomplicated fruitiness. But the Beaujolais Crus, at their best, can rival fine Burgundy. Some years ago the house of Trenel – a superb mini-negociant – gave me a bottle of 1976 Morgon. I later opened it without much hope (a substitute bottle was on standby in case I had to pour that elderly Morgon down the sink). My expectations were low, not because of its origin or age but because of the vintage. 1976 was incredibly hot and many grapes almost cooked on the vine. When tasted in their youth most ‘76s, while promisingly dark and full-bodied, seemed rough to the point of rusticity, often with coarse, even abrasive, tannins. Many seemed unbalanced – and many probably were. That bottle of ’76 bottle was magnificent. It had a bouquet so delectable you almost wanted to drain the bottle instantly. Instead, I decanted it because of its extraordinary concentration. I still remember how it smelled and tasted: raspberry, truffle, liquorice, and something ferrous. On the palate, a wonderful freshness and great purity. Tasting it blind, you could easily have taken it for a top Vosne Romanée. In theory, it shouldn’t have been this good: 1976 was a low-acid, high tannin vintage. Yet this wine, now at full maturity, had the kind of lovely acidity you find in a perfect black cherry. This is one of wine’s mysteries. Some wines, seemingly heavy and overly dense in youth, shed that leaden quality as they evolve, showing a lovely precision and succulence at full maturity. So why does Beaujolais still have such an undistinguished reputation? Surely because of the lowering effect of Beaujolais Nouveau. Though cheap, BN was very profitable indeed to the region’s big negociants. Why? Because it was available in huge volumes and could be sold within weeks of the harvest, giving an immediate return on investment. The price, while low, was appreciably higher than that of plain basic Beaujolais – a product which, lacking BN mystique, was no more alluring that a glass of flat beer. A further attraction for the profit-hungry: the rapidity of the whole, inherently low-cost operation: Grape to wine-glass in only a few days; the use of lighter (cheaper) bottles and shorter corks; the instantaneous mass-transportion of the wine at low, bulk prices. 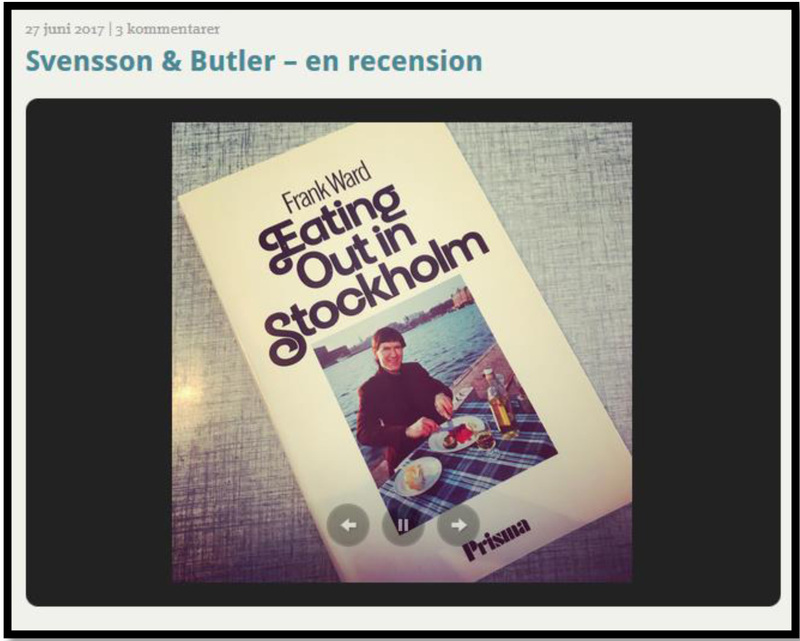 Years ago I met up with the late Alexis Lichine in Stockholm, where I was then based. We’d been invited to a tasting of newly-arrived Beaujolais Nouveau – one of the worst either of us had ever tasted. On sampling it, we both shuddered and exchanged looks that expressed more than words could. ”Alexis, “I said, “doesn’t bad Beaujolais Nouveau remind you of cheap lipstick”. But things are changing for Beaujolais. BN has largely faded away, while the Crus and Beaujolais Villages from top domains are in growing demand. Another sure sign of progress is that Intelligent producers from other regions are now establishing themselves in the region. One of the first to do so, the Burgundy house of Louis Jadot, acquired an important Beaujolais estate, Château des Jacques, as long as ago as in 1995. They now have holdings in five of the 10 Crus. Two other prescient wine personalities have also become involved in Beaujolais: Alain Graillot, a brilliant Northern Rhône producer; and the leading Rhône house of Chapoutier, which has purchased the small Beaujolais negociant Trenel, noted for its integrity and commitment to excellence. Bit by bit the Beaujolais Crus are, at long last, gaining the respect they deserve. A week or so ago, on a brief tour around Romanèche Thorins – centre of the beautiful Beaujolais region – I dropped in on two of its best producers: Domaine la Madone, specialist in various cuvées of Fleurie, and Domaine Dominique Piron, particularly known for his Morgon and Chénas. 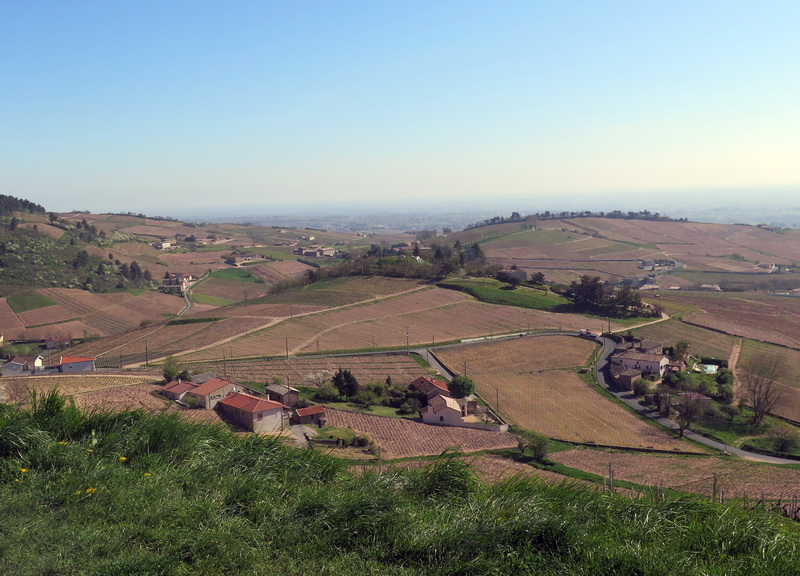 A stretch of Beaujolais landscape close to Domaine La Madone in Fleurie. The terroir is largely made up of decomposed pink granite – ideally suited to the Gamay vine and its seductive wines. At La Madone, it’s now the son, Arnaud Desprès, who’s now in charge, having succeeded his parents some years ago. 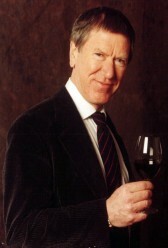 He’s expanded the estate and added several new cuvees. The total area now under vine now amounts to 19 hectares. From four-year vines and grown on granitic terroir, this has a fine linear scent with recognisable Viognier character. A decent wine, if lacking the concentration that older vines would have given. Light and elegant, it would make a useful accompaniment to shellfish or simple fish dishes. Over time, this cuvée is sure to improve in leaps and bounds as the vines grow older. The colour is medium deep, the nose flowery and pure. If a bit light side, it shows energy and is fairly long on the palate. Will improve for about two years. The colour is lightish, the nose drier but creamier, a meld of crème de framboise and red cherry scents. It broadens on the palate, and is noticeably more tannic than the previous wine. The finish is firm, if a shade bitter. Needs keeping two or more years. A step up in quality. Once again, light in colour but altogether fuller on both nose and palate. There’s a feeling of flowery intensity, with the promise of future finesse. Strawberry compote and raspberry come to mind. The flavour, if on the delicate side at this stage, is persistent. The firm finish is bolstered by fine tannins that are in harmony with the fruit. Very good. Will improve for 5 years at least. This particular cuvée lasts well: I still have bottles of the 1996 which are delicious. Grown on decomposing granite on south-facing slopes, this is darker and fuller on both nose and palate. The big aroma calls to mind blood orange, red cherry, and orange peel. It’s denser still in the mouth, with a twist towards damson and black cherry. The finish is long. Ideally, should be kept back 2-3 years and enjoyed over the following four or so. Another shift in style: darker and more assertive, redolent of red grapefruit and raspberry. The flavour is intense, dark fruits in the ascendant, with a glossy texture and the promise of burgeoning sapidity over the coming 6-8 years. This is the fullest wine so far; but that shouldn’t obscure the fact that the Vieilles Vignes cuvée, while seemingly lighter, will surely live at least as long. Made from extremely old, low-yield vines, this wine is intensely coloured but a bit cloudy. The nose is rich and round, emitting scents of ripe Victoria plum and sweet prune. It’s also a bit gamey. The flavour fills the mouth with old-vine Gamay fruit and is so rich, in fact, I find myself thinking fleetingly of a Gigondas from the southern Rhône. Nonetheless, it retains that characteristic Beaujolais freshness. This is a demonstration of the fact that a Cru Beaujolais fashioned from really old vines can sometimes show as much body and weight as, for example, a Côte-Rôtie or a Pomerol. This example should improve for at least 12 years; it might even astonish us in 15-20. 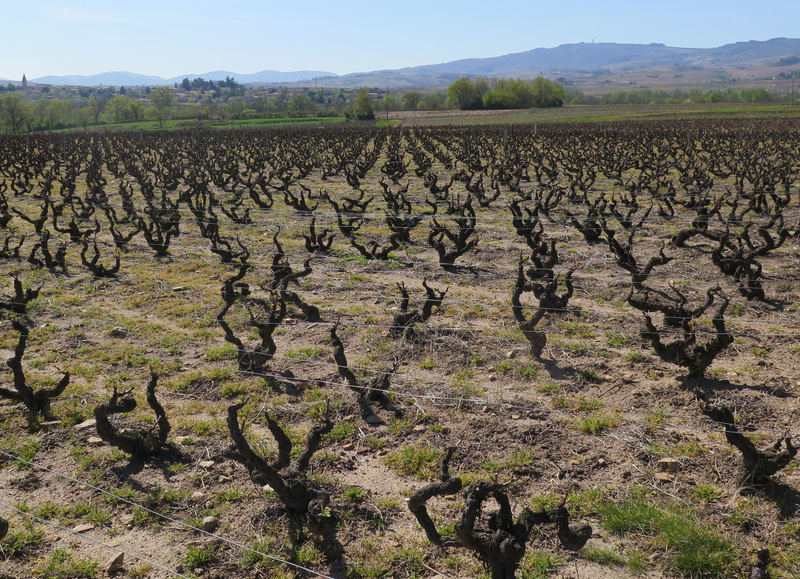 Gnarled old Gamay vines shortly before the first green shoots appear. How they fare in coming months will determine the style and quality of the 2017 vintage. Now to DOMAINE DOMINIQUE PIRON in the tiny hamlet of Morgon. I’ve known Dominique for over 20 years but, prior to this visit, hadn’t seen him for some time. He now possesses fully 95 hectares of vines covering eight of the 10 Crus, as well as owning plots in Beaujolais Blanc, Beaujolais Villages, and plain red Beaujolais. There’s also a small output of Crémant de Bourgogne. Dominique Piron holding a piece of quartz from his Chénas vineyard. It bears an uncanny resemblance to a slice of streaky bacon. A light greenish yellow, the wine has a fresh, appetising scent of greengage and chlorophyll. On the palate, good concentration of Chardonnay fruit, with a subtle hint of pear. Vibrantly fresh, medium-bodied, it will drink well (as aperitif or with seafood) over the coming 18-24 months. A glowing purple, this has a vital, expressive scent suggestive of black cherry and peony. A bit closed on the palate, but vibrantly fruity, with ripe tannins giving grip. Made from plots in four communes, it will drink well for at least 2-3 years (Brouilly, together with Chiroubles, is the most precocious of the Beaujolais Crus). Deeper and richer in colour, this first of two different Morgons has a silky nose packed with luscious black-cherry fruit. Round and sappy in the mouth, it shows unmistakeable signs of power and structure. The finish is gritty, deriving its special texture from sandy, alluvial soils. The black cherry finish leaves the palate anointed with intense, persistent Gamay fruit. Will improve for a good 8-10 years. Darker still, it’s more assertive, with more sinew, than the preceding Morgon. The nose billows out of the glass, a dense, composite smell of a whole panoply of black fruits. A richly expressive wine, full-bodied and vigorous, with enough stuffing to go on improving – and revealing ever more layers of scent and savour – for over a decade. (“From the oldest terroir in Beaujolais,” says Dominique). On the day, the most seductive of all. The colour is nearly black, the nose highly concentrated and packed with noble, old-vine fruit: black cherry, chocolate, damson jam. A truly sumptuous nose, promising depth, vitality, silky texture, persistence. This is fulfilled on the palate, where the above flavours are supplemented by dashes of crème de cassis and liquorice. Enticing in youth, it will evolve splendidly for a decade or more. A year older, a hint more evolved, this has a lovely seductive nose of wild strawberry, cherry, and raspberry. A lovely sappy wine to enjoy now and over the coming 3-4 years. Dominique shows me a piece of quartz rock from that very vineyard. “We call it ‘bacon”, he tells me with a smile. In pink and white stripes, it does indeed look like a thick slice of bacon. The colour is deep and lustrous, the nose evoking black cherry, elderberry, and peony, with that special, very natural sweetness of wholly ripe grapes. The flavour is rich and sappy, weighty, with that slightly gritty finish typical of wines from granitic soils. A splendid wine, only now at full stretch at 17 years. The tasting now concluded, Dominique tells me a piece of somewhat poignant family history. To set the scene, he explains that in the 19th century the terroirs of Burgundy and Beaujolais enjoyed equal prestige and the land in both, per hectare, cost roughly the same. His great-grandfather was presented with the chance to buy plots of land, roughly the same size, in either in Burgundy or in his native Beaujolais. The latter was literally on his doorstep. All things being equal he opted for the Beaujolais plot. The full implications of that choice only became clear a century or so later. Research showed that the Burgundy plot that had been declined was the fabled Clos de Tart! Prior to my short sojourn in Beaujolais I’d spent a few days in Lyon. This is the city of which Alexis Lichine had written: “Three rivers flow into Lyon – the Rhône, the Saône, and the Beaujolais.” The city boasts plenty of “bouchons” – simple restaurants where good wholesome dishes are served, together with good local wines at affordable prices. Particularly pleasant lunches were enjoyed at Daniel et Denise Saint-Jean in Vieux Lyon and at Léon de Lyon in the city centre. At the latter, however, I was given an insight into the low esteem in which some of the locals still hold the wines of Beaujolais. 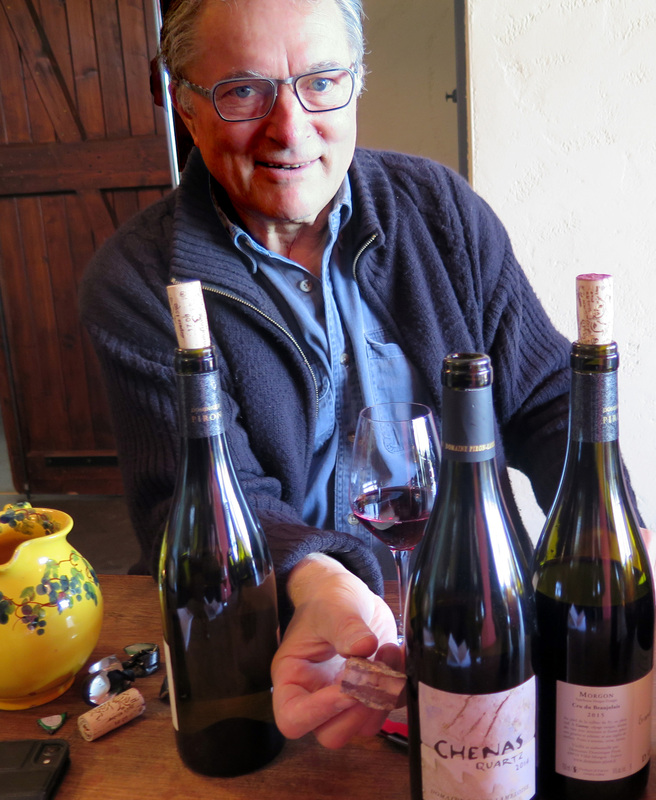 I’d just ordered a bottle of Dominique Piron’s gorgeous 2014 Chénas “Quartz” and – seeing that the waiter was going to serve it in cheap, ludicrously small glasses – I asked him to pour it into grands verres instead. “But the big glasses are only for the good wines!” he replied. Only when I insisted did he bring out the larger and more appropriate ones. An expensive meal at the two-star Mère Brazier was disappointing – elegant dishes, but prepared without passion – whereas a dinner at the one-star Restaurant Pierre in Mâcon was simply splendid. Tasty dishes, cooked with real dedication, and two really lovely wines: 2013 Vire Clessé Vieilles Vignes from André Bonhomme and a mellow 2009 Morgon Grand Cras from Joseph Burrier. The whole meal for two: just 180 Euros.